aNewDomain — It comes as a shock, apparently, to researchers at the Federal Reserve that millennials aren’t buying homes at a steady pace. Heavy student debt is the likely culprit, according to their report. As a representative of Generation Z — that means I’m among those born between 1995 and 2006 — I can’t imagine that the economic prospects will be any better for my generation. I actually assume prospects will be much worse. We’re just in our teens, and the future looks far rockier to us than I’m sure it did to older generations like our parents and grandparents. Yes, I know about the Great Depression, but I think that was considered an anomaly even then and not the new normal. Yes. I am lazy. That is, I am not as productive as I should be. This should disturb all of us in Generation Z.
I mean: Are we the next millennials? Or has the world seriously changed? As the years go by, it is becoming harder and harder for people to succeed in life given that many things are becoming increasingly hard to afford even in a period of mild inflation. The hopes for the future of the people in the world I know is plummeting, dramatically. My generation is just beginning to make its way in the world, coming up right behind the millennials. You know, millennials, the folks that older generations complain don’t spend their money wisely. The older generations also complain that the millennials are way behind where they were at a similar age. It is true that millennials aren’t thriving as much as the older generations did at the same age. But I don’t think the reason is not due to poor spending choices. Rather, it is due to the fact that millennials are paid less than their parents were at their age. Despite more education, massive student debt and sky high rents make it impossible to save up, and home prices are at a record high. Based on how this problem seems to continually worsen, my concern for the newer generation (that includes me) grows steadily. This article will focus on three main issues: the millennials and how being criticised is unjust as is their current situation, how to hopefully prevent the highly possible “failure” outcome for my generation (Generation Z), and lastly the hope and concern for generations to come. Avocado toast. Starbucks. Latest iPhone. What do these words all have in common? Expensive, yes, but as a standard stereotype, who is considered to have purchased these items? Millennials. Yes, millennials buy expensive stuff. But look: Nearly all people, including those criticising millennials do too. The main reason why Millennials spend more money than older generations is because products are so much more expensive now. They are generally not wasting their money like many people expect or think. They are buying goods that they need. Everyday products that are necessary to own such as a house, education, a phone, etc cost more than they used to in the days when Baby Boomers were the age of millennials causing them to have trouble with making a living. So, How Much Does Everything Really Cost? University prices are just one example of this and is a major explanation for the Millennials who continue living in their parent’s home. According to the College Board, the average cost of tuition and fees for the 2017–2018 school year in the US was $34,740 at private colleges, $9,970 for state residents at public colleges, and $25,620 for out-of-state residents attending public universities. That is a lot of money — especially given the fact that median individual income for full-time workers in the United States is currently $876 per week, or $45,552 per year. This is even worse because this is the amount of dollars people earn if they work full time, and college students most likely earn less because they are unable to work full time. Obviously, most students have parents paying for at least some portion of their education, but that does not change the fact that there are many students whose parents cannot pay the full tuition and there are students who come from economically impoverished backgrounds. And now consider that that’s only for the average university. What about the higher end schools that everyone has told them they must attend (or else)? Students will either have to sacrifice to pay off expensive student debt for a long time or they will need to go to a different college that is cheaper but may not be as good – but we MUST go to the best college that will have us – or so we’ve been told since kindergarten. 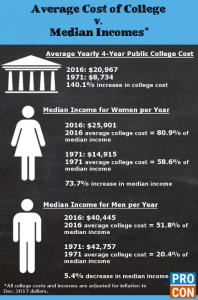 If the average parent makes median income $45,552 and they have to pay for average private college $34,740 then they will have $10,812 remaining. This may seem like a large amount left over but it is not because the parent still has to pay home bills, car bills, food, clothes, maybe paying off their own debt, etc. The cost leftover paying for out-of-state public universities is slightly better and the cost leftover paying for a public in state university is significantly better. But what if the student won’t be able to attain the educational experiences they want because the university doesn’t specialize in their field of interest. In 1971, when Baby Boomers were going to college, the average price for private universities was $2,930 and public universities cost $1,410. The average man was paid $6,910 in 1971. The average private university in 1971, $2,930, is worth $17,733 as of 2017. The median income in 1971 was $6,910 but is equivalent to $41,821 as of 2017. This leaves the man with over twice as much money leftover nowadays. The man would have $24,088 leftover in 2017. Home prices are at an all-time high right now and that is most certainly not good for the millennials especially after paying for college or having massive student debts they need to pay off. The median home price in the US is $200,000 and the monthly average rental for a one-bedroom apartment is $952. And yes, that figure blends Tucumcari with San Francisco. In 1971 home prices were equivalent to $144,651 and the average monthly apartment rental is now worth $653. A pattern is developing and that is, inflation while not terribly high in the US is still higher than wage growth. In other words, if wages can’t keep pace with inflation, then we get poorer. It’s really just that simple. According to the Bureau of Labor Statistics prices in 2017 are 505.23% higher than prices in 1971. The dollar experienced an average inflation rate of 3.99% per year during this period. But wage growth has been much flatter. Since the time of US Pres. Ronald Reagan, the US has made all kinds of adjustments to its society to build and maintain a showboat class of billionaires, and by a complicated explanation, constructing the shiny edifice of billionaires has tanked wages – simply put, if the owners keep more, then everyone else gets less. You don’t have to like Karl Marx to understand that. So how can young people succeed? Due to all of the examples above, more and more millennials move back home after college because they simply cannot make a living for themselves. Millennials do not have enough money to buy a home and to make that money without a job that pays more than the job they’re likely to get. Despite having more education than their parents, millennials are having a tougher time getting jobs because the job market is extremely competitive nowadays and most want workers to have impressive resumes or lots of education to prove that they will be fit for the job. Young adults or people who recently graduated from college/university undergraduate degree usually do not have long resumes and do not have a massive amount of education. This leads to the adult staying at home and earning money from an easy job so they can pay for more education. According to the Association of American Colleges and Universities, many employers believe recent college graduates are underdeveloped in key workplace skills such as communication, critical thinking, and organization. There are not many classes in general workplace skills at most universities, and college students focus on their career studies. It used to be assumed that students came to the university with life skills. If you go back to the roots a university education was about polishing rich gentlemen for society, which might not have entailed their even having a career. This situation makes it harder for Millennials, who believe themselves to be highly qualified, to land even the most basic jobs. For example, a person may have recently graduated from an IVY school, but because the job market is extremely competitive, they may not be able to get the exact job they want and earn the amount of money they hoped for so they need more money to pay for more education. Where do they find this money from? The job that they get might be all sorts of things, but the job that somehow appeals to millennials the most is becoming an Uber driver. Seriously. A third of all Uber drivers are millennials. Lastly, technology advances constantly, every day, and this is another cause for millennials not having the same lifestyle as their parents. When Baby Boomers were the age of the average millennial there wasn’t nearly as much technology in the workplace, which didn’t shrink the pool of available entry-level jobs. For example, robots or computers have taken over many jobs that used to be available not even ten years ago. The places where computers have already taken over is at grocery stores in the US such as Target or Walmart where there are over double the amount of computers for scanning your item than amount of people behind the register. The idea of “robots taking over the world” isn’t so far fetched anymore. Within the next 10 years, even more jobs will be mainly run by robots. According to Michael Grothaus from Fast Company, some of the jobs that will be taken are jobs involved in banking, financial analytics, construction, farming, driving, manufacturing, and journalism. In the long run, the only jobs I can see run by humans are in the entertainment business, fashion, and a judge in a court of law. My reasoning for this is because these professions have to understand how the human brain is thinking and I do not think robots are capable of doing that. Now, of course, fancy advertising lures us into buying products that we do not need. (Dear parents: remember when you let the TV babysit us because you were too busy with work or play – well, we’ve been conditioned since childhood to be consumers, high-end consumers, so maybe it would have been cheaper in the long run to have spent some more time with us. Just saying.) Our purchasing habits can be anything from the newest phone to a brand new, expensive car. Baby Boomers were at the beginning of the American addiction to expensive and advanced products that one can’t live without. Millennials and Generation Z have grown up with this market and have seen ads, commercials, videos, etc. of why “this product is right for you”. It is hard to say no to something you’ve been with your entire life. Technology has progressed the most in Millennials lifetime. For example, in Millennials lifetime the first smartphones were produced and advertised when they were little causing them to buy one and now for Generation Z big expensive computers, cameras, and luxurious smartphones. In Baby Boomers life they saw this too but they lived without it for so long, it wasn’t quite so appealing as it was to Millennials and Generation Z who observed this from an early age. This unfolding disaster scares for Generation Z and future generations. I am almost certain all of the things I listed that is making Millennials having a hard time living will be worse for my generation. I think that prices for education and technology will continue to grow making everything almost impossible to pay for, I think that the job market will be extraordinarily difficult making it even harder to get a “dream job”, and that technology will not stop advancing based on everything that has already happened to the previous generation. What will happen? Unless something changes, nothing good. Only time will tell. For aNewDomain, I’m Audrey Ewing. Alton, Larry. “Millennials Are Struggling To Get Jobs – Here’s Why, And What To Do About It.” Forbes, Forbes Magazine, 22 Dec. 2016, www.forbes.com/sites/larryalton/2016/12/22/millennials-are-struggling-to-get-jobs-heres-why-and-what-to-do-about-it/#2293019f4bb0. Martin, Emmie. “Here’s How Much More Expensive Life Is for You than It Was for Your Parents.” CNBC, CNBC, 21 June 2017, www.cnbc.com/2017/06/21/life-is-much-more-expensive-for-you-than-it-was-for-your-parents.html. Graph of Millennial Workers, Matt. “Uber For Outplacement: The Gig Economy and The Death of HR.” Recruiting News and Views @ RecruitingDaily, Recruiting Daily, 26 Aug. 2016, recruitingdaily.com/uber-capitalism-gig-economy/.